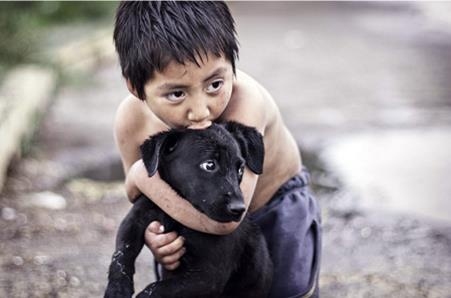 The dog is called the best friend of man. But if you don't interact or pet the dog in appropriate manner this axiom could fail. It may bite you. Or your relationship with it can go wrong forever. Remember that animals are not like machine or in other way, don't think they are dumb creatures. They are very smart and intelligent animals. They have psyche as humans have their own. Here are 8 tips to make you understand their psyche and pet them accordingly. When you would spend time with your dog or someone else's dog you would come to know where it enjoys the petting. Some dogs enjoy belly rubbing, while others like leg massage. Some will growl when you reach near those areas. Look at its body language and focus on the sweet spots. If it moves its tail, shows relaxed muscles, and makes sounds when you stop petting are the signs that it is enjoying the petting. Always see that the dog is relaxed. Drooling can show excitement, but it doesn't mean that it is relaxed. You may feel that if the dog is lying with its belly towards you that it is amused. In fact, it may be afraid or may be trying to please you. It may not be asking for belly rub even if you think that it is. Dogs may lie down with belly upward for other reasons. If it shows signs of nervousness, unhappiness or tension, stop rubbing the belly. After getting relaxed if it lies down again, then it may be liking it or want you to continue. Then do it gently. 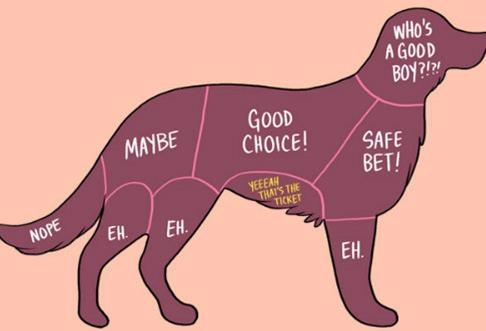 Don't belly rub unfamiliar dogs. It may alarm them and they can get defensive. Pets usually remain nervous in the children's presence. The way children treat and pet makes them nervous. Children can beat them while play and mishandle them during petting. The general rule to follow here is to teach children to remain at a distance from dogs. They may grab, hug, kiss or even bite them in play. The sudden and violent action may make dogs defensive and even lead them to bite the child. Teach the children not to grab the dog's tail or throw anything at them. Generally, it is safe from medical point of view that small children remain away from the dogs. Now and then, massage your dog from head to tail. Don't do this with unfamiliar dogs and never with stray dogs. It could be very dangerous. Only massage familiar and relaxed dogs. Begin massage of the face in a circular motion to the chin and go over to the chest. Rub on the neck, shoulders and move to the back up to the tail. If you have made leg massage before, perform it. Massaging is not only healthy and enjoyable experience as it regulates blood circulation and calm the nerves, it also help you track the lumps on the body. You may know which are normal bumps and which are health problem. Massaging on leg improves the blood circulation. Some dogs don't like anyone to touch their paws. For this, carefully pick up the paw. If dog resists, than let it go. Keep trying as leg massage prepares for paw inspection. Paw inspection is necessary if your dog is pricked by some grit or pointed object. You can locate the painful object and remove it. Similarly, if your dog is used to leg massage and picking up paws than you can trim the nail quite easily. Paws may get cracked. For this, get a suitable moisturizer from the vet and rub it gently on its feet. 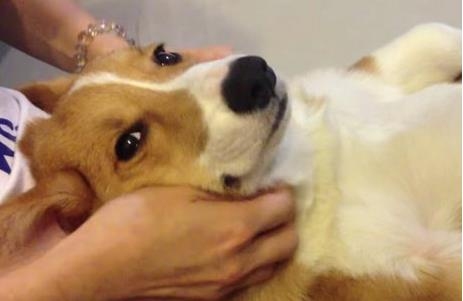 Massage on face is only for familiar dogs as dogs don't like anyone get near their jaws. Get your pet accustomed to face massage from an early age. Puppies like face and foot massage. As mentioned earlier, it is not only enjoyable, but also necessary to prevent any disease. Facial massage is good for puppies who are teething. If your dog gets any dental disease, then you can get it checked easily if it is used to mouth handling. Massage the puppy's face in a circular pattern from cheeks to the jaws. For dental massage use finger toothbrush which is available from veterinarian or pet store. The best way to socialize with a new dog is to play with it. As man likes to play games, animals also like to play. Their young spend their childhood in playful activities. Dogs thrive on play. You can play with a stick or use ball. Occasionally, go for a walk in a park and take a ball or stick like object with you. A few hour play will be very good for your dog physically. Similarly, your dog will get to know other dogs and would become more friendly to dogs and humans. They may growl or make sound while playing. It could be signs of excitement. It could also mean something else, so you need to be careful while playing (as it may have hurt itself). Unlike cats, dogs are more affected by weather. So you need to be careful if you have a dog. For winters, buy a wardrobe for your dog. It may seem ridiculous, but in fact it is very important. Buy jersey, footwear and headgear too. Don't feel intimidated by friend's humor. It is your dog and you need to take care of it. In summers, bath your dog daily with good shampoo and conditioner. Prevent it from out in strong sunlight. If you find your dog tense, nervous, growling or down see the veterinarian. Some diseases are contagious. Flu from pets can infect children and adults. Petting a dog is a joyful experience for both the dog and owner. But petting right is the key. Understand the psyche of dogs can help you pet them better. With good petting, your dog's health will remain good both physically and mentally. It would also help your dog to socialize better.